Eunice, a MM Groupie, was intrigued by the idea of growing and using her own bean sprouts after hearing how easy it is to do. But, she recently heard that they may be a source of food borne illness. What's up? Sprouts are formed by any germinating seed. While the most popular sprout is alfalfa, sprouts can be made from other seeds such as pumpkin, radish and carrot, soy and mung beans, peas, wheat, corn and barley. You can purchase sprouts or you can easily grow your own from the uncooked seed, bean or grain itself. All you have to do is keep the seed warm and damp but not wet, and most will sprout within days. Sprouts have long been given "thumbs up" by healthy eating fans and more recently by those interested in eating raw foods. With only 10 - 30 calories in one cup, sprouts offer a some protein, are high in fiber and contain a small amount of vitamin C, K, and traces of other vitamins and minerals. In reality, there are many, many other fruits, vegetables and grains with much richer sources of protein, vitamins and minerals than sprouts. Most people are unaware of any potential risk when they add sprouts as toppers for salads or on sandwiches. Unfortunately, sprouts are a easy target for bacterial invasion, since sprouts are grown in the same warm, damp environment favored by bacteria. Bacteria culprits include salmonella, listeria and E. coli. A good number of food borne illness outbreaks have been linked to consumption of raw or lightly cooked sprouts. Some people think growing your own sprouts is safer, but that's not necessarily true. Since the bean or seed itself carries the bacteria before sprouting, even sprouts grown at home in a clean environment will not guarantee food safety. And you can't rely on washing to provide safety since bacteria multiply very rapidly under good growing conditions. Some treatments have been developed in industry to kill the bacteria but no process can positively eliminate it all. To eliminate your risk of food-borne illness, make sure you do not consume raw sprouts on any salad or sandwich, especially when eating out. At home, washing the sprouts thoroughly in running water reduces the amount of bacteria present, but cooking is necessary to kill most all of the harmful bacteria. Young children, the elderly, and people with weakened immune systems are more apt to develop problems if they develop food-borne illnesses. 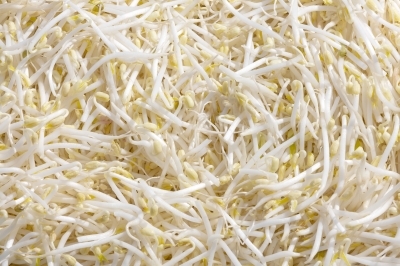 This at-risk group should completely avoid raw sprouts not matter where they are grown. The Mind-full Motivator LLC, Copyright 2016.